Bathroom sink is one of the most essential items at any bathroom, as you can’t find any bathroom without sink. In the past, bathroom sinks used to many purposes, due to improvement of the shower and bath, people want the bathroom basin only to wash hands, clean teeth and for wet shaves. 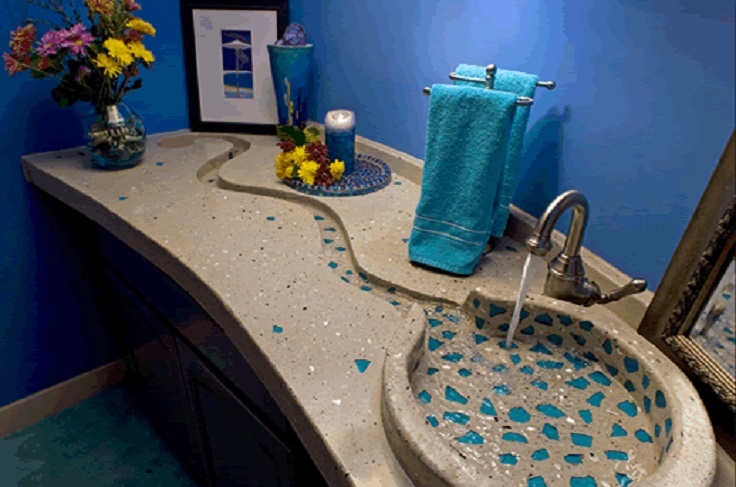 Bathroom sinks can be found in various styles and designs, from glass sinks to wooden and sinks made from actual rocks. 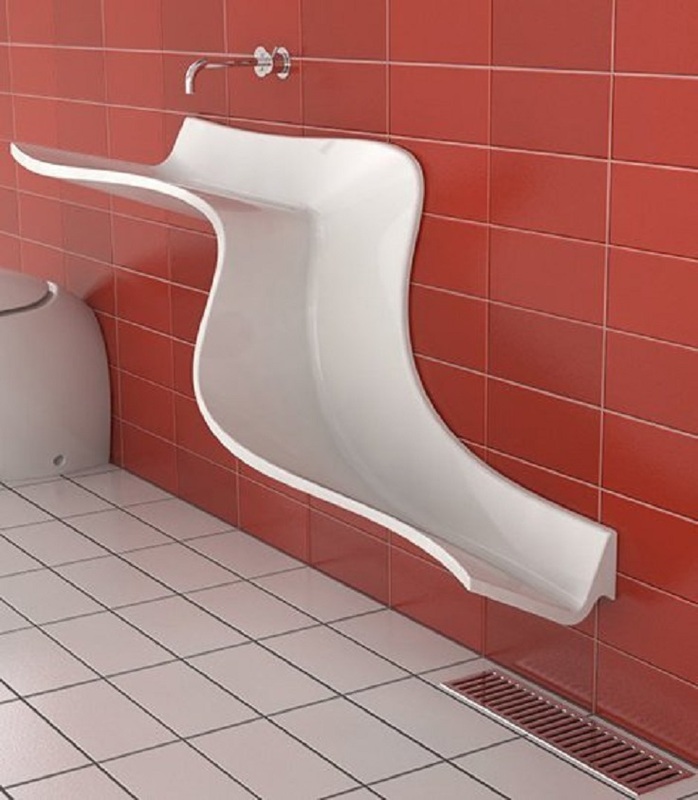 There are many beautiful and modern designs of bathrooms sinks but for those of you who seek something a little different for your bathrooms we made a selection of top 10 artistic bathroom sink designs. We love how good design can transform something humble, like a bathroom sink, into something breathtaking. So, feast your eyes on these 10 gorgeous examples. 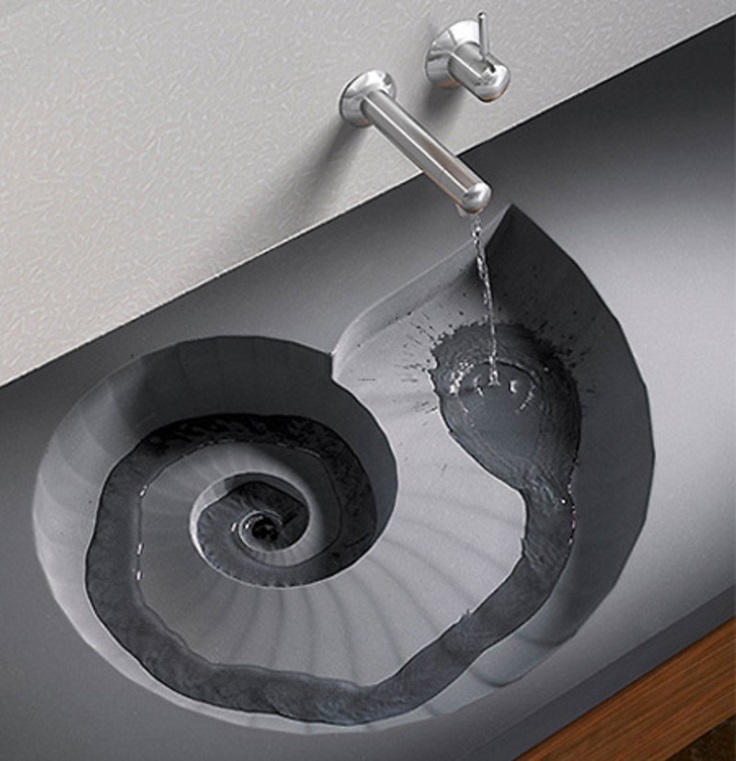 This clever sink design shaped like the imprint of the shell should be centerpiece of an interior bathroom design. Water follows spirals effect and flow into the drain on its own. It is very modern and unique! 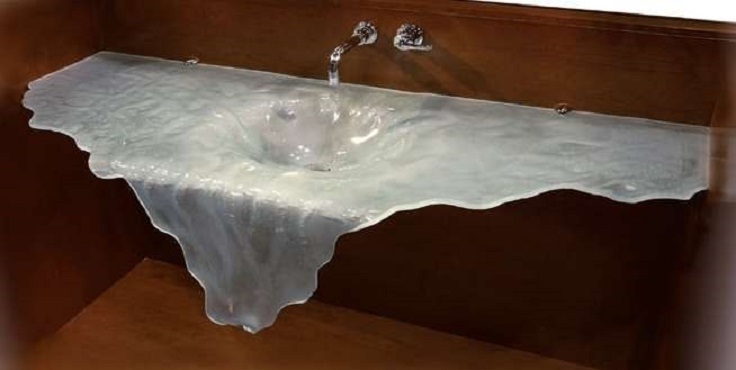 This spectacular bathroom sink is like a manifestation of the water falling into it. The vessels seem so delicate and it look like melting ice. 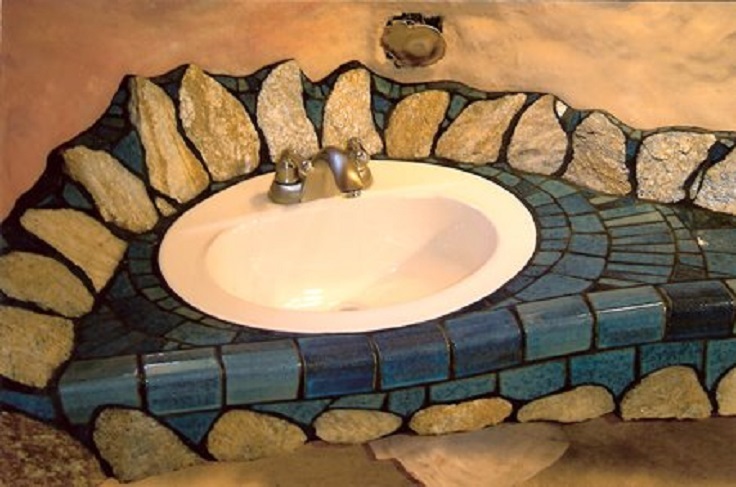 This is surely eye catching artistic designed bathroom sink. 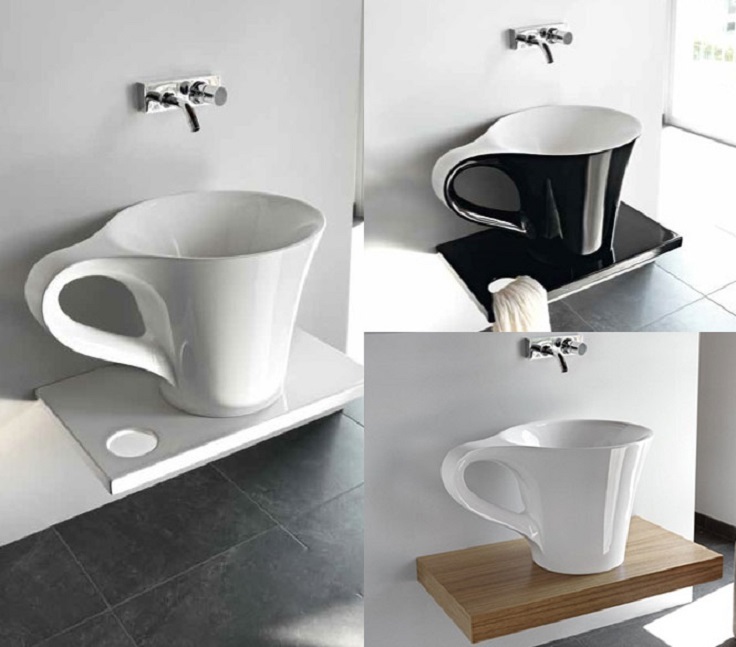 A basin resembling a huge coffee cup is charmingly suited for purpose, with an integrated towel rail at the ‘handle’; this piece speaks for itself, so team with simple surroundings and a minimalist wall mounted faucet. Clean, seamless vessels become contemporary works of art when stark white ceramic is adorned with striking black line work and pattern, and the simplicity of a single sheet of curved glass floating beneath a waterfall faucet is clearly stunning. Modern materials and design have brought new life to the bathroom sinks. This in an example of transforming traditional bathroom pedestal sinks from white porcelain into a piece of art. 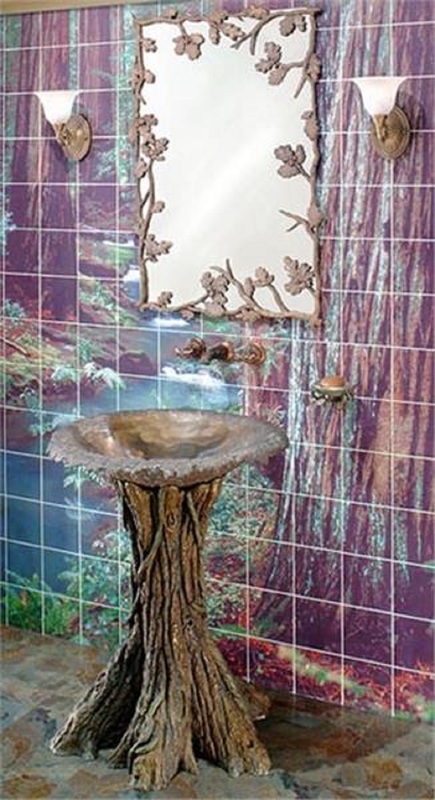 Take a look of this bathroom sink and step into the world of a fairy tales. 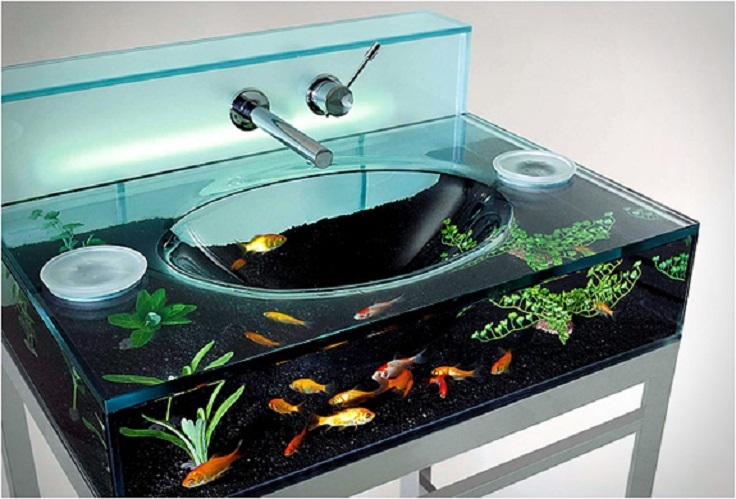 This aquarium bathroom sink is unusual, for sure, but adds an eccentric touch for those who appreciate a unique design. The aquarium sink has a removable top, which facilitates cleaning and two circular entries for fish feeding. It features a large sink light and an engine is included for filtration, water circulation and oxygenation. 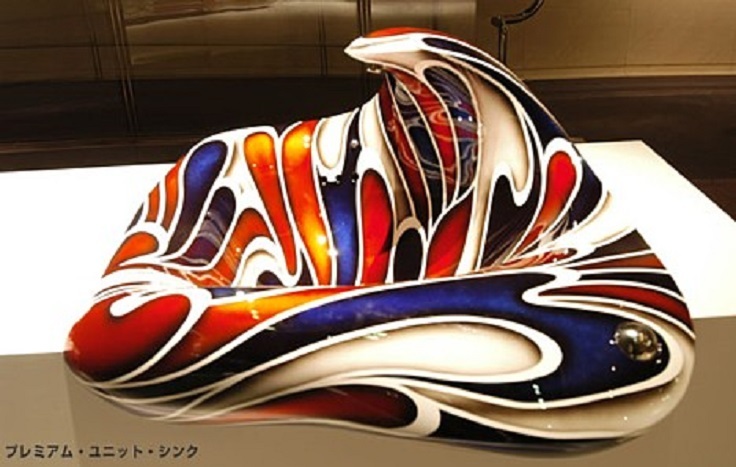 With the DIY in mind, the artist Tetsuya Nakamura designed this premium unit bathroom sink from fiber-reinforced plastic and painted with colorful, fluid patterns meant to evoke a sense of speed. This bathroom sink have definitely wonderful curvaceous, luxury and artistic appearance. This artistic bathroom design is great idea for kids, they would love it, and it would be lot of fun in the bathroom. The bathroom sink have contemporary, modern and fashionable design. Simple adorable! This striking design brings an entirely new meaning to water basin, using a beautiful arrangement of ducts and channels like a 3D topographic map. While the spacing between channels may seem random, the wooden map actually represents a portion of the streets in the central part of London! The designer of this unique piece of art is Julia Kononenko. This design is inspired by nature and build with natural, local and salvaged materials. The flower bathroom sink is simply wonderful! 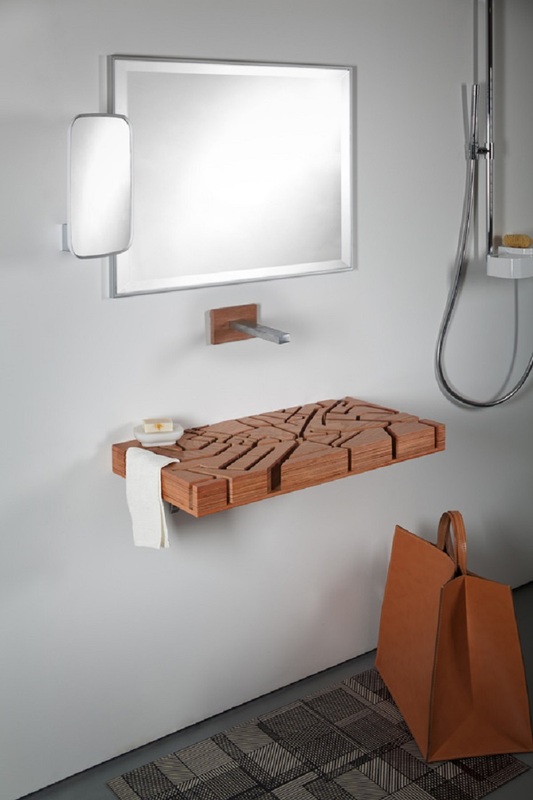 The Abisko Washbasin from Eumar is a totally new concept for our modern lifestyle. Inspired by the unspoilt waterfalls of the Swedish National Park Abisko, the sink is unfettered by pipes. Nor does it allow water to accumulate in a big tub, something designers Johan Kauppi and Lars Sundström deem unnecessary. Breathtakingly brilliant an extraordinary sculptural piece!